This page is about the unincorporated town. For the adjacent incorporated city, see Big Bear Lake, California. For the lake, see Big Bear Lake. Big Bear City is its own census-designated place. According to the United States Census Bureau, the CDP has a total area of 32.0 square miles (83 km2), 99.95% of it land and 0.05% of it water. 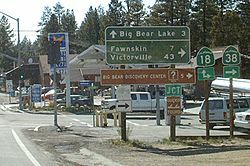 Most of the town and the business district are centered on Big Bear Boulevard. Its limits are defined on the West by Division Road and on the east by the left turn at Highway 38, which goes to Redlands and Highway 18 which goes to downtown San Bernardino. Though its south boundary is loosely defined by the residential boundary, the north side is defined by North Shore Road. The east-west postal divider of Big Bear City is Green Way Drive. 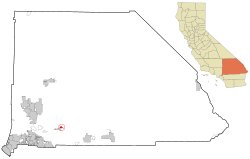 It is here that Highway 18 (Big Bear Boulevard) turns north and crosses over to North Shore Drive heading east toward Lucerne Valley, and Highway 38 coming from the east turns north to North Shore and heads west to Big Bear Dam. It is often the location of altitude training for many Boxers and Mixed martial arts contestants such as Oscar De La Hoya, Shane Mosley, and Tito Ortiz. The population was spread out with 2,865 people (23.3%) under the age of 18, 917 people (7.5%) aged 18 to 24, 2,695 people (21.9%) aged 25 to 44, 4,060 people (33.0%) aged 45 to 64, and 1,767 people (14.4%) who were 65 years of age or older. The median age was 42.9 years. For every 100 females there were 102.7 males. For every 100 females age 18 and over, there were 100.4 males. In the CDP, the population was spread out with 26.5% under the age of 18, 6.9% from 18 to 24, 27.3% from 25 to 44, 25.9% from 45 to 64, and 13.3% who were 65 years of age or older. The median age was 39 years. For every 100 females there were 98.2 males. For every 100 females age 18 and over, there were 96.0 males. Big Bear City, California Facts for Kids. Kiddle Encyclopedia.